The Grey Squirrel is diurnal and most active at dawn and dusk, when it searches for available food. Compared with the Red Squirrel, it spends more time foraging and feeding on the ground than in the trees. It is, however, very agile in the trees and can run along slender twigs and leap from tree to tree. The long, muscular hind legs and short front legs help it to leap. The hind feet, longer than the front, are double-jointed to help the squirrel scramble head first up and down the tree trunk. Its sharp claws are useful for gripping bark and the tail helps the squirrel to balance. If a squirrel should fall, it can land safely from heights of about 9m (30ft). The Grey Squirrel can leap more than 6 metres! 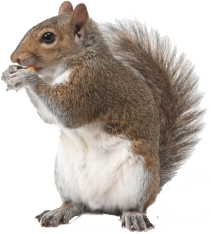 Squirrels have good eyesight and often sit upright on a vantage point to look around them. They also have a keen sense of smell. As the name suggests, the eastern gray squirrel has predominantly gray fur but it can have a brownish colour, Its underside is white and has a large bushy tail. The head and body length is from 23-30cm and the tail from 19-25cm and an adult weight varies between 400- 600g. Females can mate only twice a year usually in the spring and again in the autum and have a litter of on average 3 however as many as 9 babies can be born. Males may mate at any time but after mating, the male plays no part in the rearing of his young. Although the Grey Squirrel is attractive, appealing and entertaining, it can be a serious pest in the garden and especially to a bird lover. It is very bold and soon learns to take food from bird tables, chew through plastic peanut feeders and take the food from within. They will also destroy birds’ nests to eat eggs and nestlings, and damage trees by chewing off bark, which can in some cases kill small or young trees.